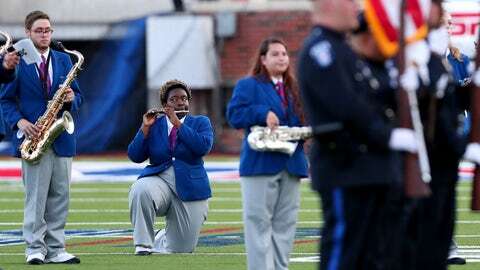 The national anthem protests at sporting events had been limited to the players until Friday night, when several members of the SMU marching band took a knee before the Mustangs’ home game against TCU. The Mustangs wore special decals on their helmets on Friday to honor Dallas police officers and first responders who have died recently. The band members are the latest to follow the lead of San Francisco 49ers QB Colin Kaepernick, who originally protested by sitting during the national anthem but then began to kneel.